These beautiful pieces of Metlox Poppytrail include a butter dish, pitcher, creamer, sugar, and 2 different sizes of serving platters. In the 1950s Metlox introduced a line of modernist dinnerware featuring free form designs and squared plates using “blanks” that were then decorated with designs and colors. These were then marketed under the pattern names of “California Contempra”, “California Modern” and “California Freeform” names. The company operated from 1927 until 1989. 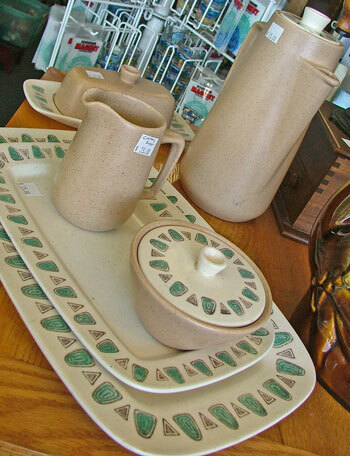 Stop in and see this beautiful set. We’ll be watchin’ for ya!